I missed President Obama talking about getting Cousin Pookie off the couch to go vote last winter. The election results indicate that “Pookie n nem” stayed right there on that sofa, futon or whatever. As Secretary/Senator/former FLOTUS Hillary Clinton ramps up her campaign, she must know that the actions of Pookie, Ray Ray and n nem in the fall of 2016 could tip the balance of the presidential election. First, I declare my continued admiration for cool presidents Barrack Obama, Bill Clinton, JFK and Teddy Roosevelt. However, Obama is all kinds of special with his coolness. He is so cool that I support him in general when I would have personally preferred different positions on matters. But, that’s cool because the American people selected him and I respect the process. I even respected the Office of the Presidency during the Bush Administrations—something many of my Republican friends can’t current say. I would like to add that not respecting the process and ignoring laws that you don’t like is in my opinion un-American. I keep hearing that President Obama will be on the “right side of history” about this and that. He is that bold kind of guy but sometimes he is doing what he knows is right as opposite to what the nation in general wants….like Lincoln. In college pol sci class, we called that a trustee elected official. That trustee puts the information on the table and makes a wise decision. Of course, we didn’t have the freaking internet information/new media machine in college and everyone wasn’t an expert on everything. I know Pookie and Ray Ray n nem more and better than 95% of the politicos and staffers in Washington because I am part of nem (corruption of them.) Since I was sent to political and financial exile in the “kountry,” I have been listening and learning like Napoleon. I watch football on that same couch with Pookie before I went to vote but getting him to go is hard because the “Right side of history” Democrats seem to have less interest in the rural “we can’t win there” areas and more interest in needs of the Latino and gay communities….that’s what the homeboys are saying. If the first Black president can’t get them to vote when he isn’t on the ballot, can the Dems count on that block in 2016? If there is hope, it starts with listening to their concerns and explaining clearly and plainly what alternatives would be. Scary them with the truth then take it back to the future. Black moderates should be talking about a less government- involved community similar to the 1950s and 1960s. Of course, the government is need to protect basic civil rights for all Americans but Ray Ray is starting to see kids coming up (not growing up) expecting the governmental safety net and that expectation thwarts personal development and achievement. While we were under constant fear of domestic terrorism before 1970, we were grinding hard to improve ourselves—we were mindful about how we carried ourselves. Democrats seriously having that conversation might get a few of those departed conservatives back. But, efforts like the Best Interest Initiative never get support and funding. It will be “go find the preachers and tell them to tell Black folks to vote.” Church folks will vote anyway but Pookie and Ray Ray n nem are going to needs something new and real. Could it be true: are some people too dim to vote. I just noticed a comment on a post about John Monds, candidate for governor in Georgia from the Libertarian Party. The comment said “he short as hell” and I did not know if the writer was referring to my picture with Monds or with Rep. Sanford Bishop. Monds, Bishop, and MLK are all Morehouse Men and like Dr. Benjamin Mays of Morehouse they emphasize achievement and intellectual stature over physical stature. John Monds is taking the high road in a governor race that has seen negative ads after negative ads from candidates who aren’t generally considered negative people. I think a cottage industry has developed in which people are more interested in making money from fundraising and media ads than actually winning the elections. Monds has represented the LP movement well and introduced a southern style of the LP. Nationally, the LP generally stands for freedom and liberty from government regulations and involvement. Monds has pushed those principles without bringing up the marijuana card that could spicy up his numbers with some voters. I am not for smoking cannabis or for gambling personally (gaming being another hot button issue) but many political observers would play that card with the current changes in California in mind. Monds is a powerful man in Georgia politics because his governor bid could provide ballot access to the LP for future elections and his run will likely force a runoff. Former congressman Nathan Deal is fighting to hold his base and former governor Roy Barnes is fighting to turnout the Dem base while attracting moderates. Politicos I bumped into during the local HCBU’s homecoming all said the same thing: why are Democrats spending 30 million dollars on media buys and very little on the streets. “The streets” or Get Out The Vote (GOTV) operations have traditionally been a method of awarding those with great community networking skills and those with well-earned reputations as community problem-solvers. Today, that money goes to run more and more TV ads and the real winners during election season are HBO and Showtime—no commercials. Mark my word and file this post: the down ballot Democrat candidates are suffering from a lack of GOTV and if the governor race goes into a runoff, Democrats are not coming back out because getting them out now is unbelievable hard. Some Democrats are rumored to be voting for Monds as a protest for Barnes taking them for granted while courting conservative voters. Again, are some people too dim to vote? You have Dems who cried when Obama was elected but won’t vote in the mid-term elections. We also have conservative voters whose views are shaped by TV and radio talking heads and the Tea Party Movement rather than seasoned public servants or policy wonks. When did experience become a bad thing? Rep. Charles Hatcher told me that lobbyists like dumb candidates and heavy turnover because congress is complex and under those conditions the lobbyists have the knowledge and power. 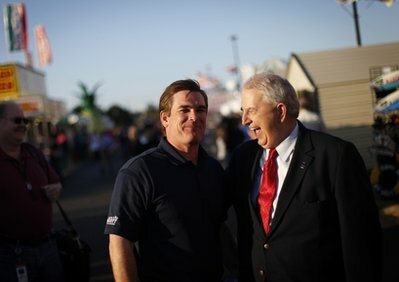 Recently, former governor Roy Barnes bumped into 8th district GOP congressional candidate Austin Scott and Barnes joked that a picture together would ruin Scott’s reputation. Barnes was so right because the GOP voters want candidates who detest Democrats and Scott must cloak the fact that Democrats and Republicans down here consider him a bright and likeable guy. Of course, there can be zero mention of the fact that Scott voted to change Georgia’s flag when Barnes was govenor. If Scott wins next month, his history of voting his mind will put him at the top of the list of freshmen Republicans that President Obama wants to know. That last line means that the conservative Austin Scott would be better for this White House than the current Democrat congressman Jim Marshall who is slamming Obama and Pelosi every chance he gets. In America, no one is too dim to vote. However, we clearly have those who are too dim to realize the importance of voting but I am not worried because they didn’t read this long blog post. If weed was legal or decriminalized, those dim cats would be even dimmer. Former Surgeon General Joycelyn Elders is off on the marijuana issue. Don’t Vote for President of the U.S. I thought that headline would get your attention. And I’m sure it did. Of course, I want you to vote for a candidate for the office of President of the United States. But I wonder. I just wonder how many of you know of anyone else’s name and/or seat that is on the ballot this year. Gotcha’. A vote for the President is not going to impact you as much as voting for a local or state seat. Or even Congress for that matter. We’re focusing so much on the Presidency, that I have a feeling many people will go to the polls and vote for the first item on the ballot (President) and then leave. And that’s a shame. Why don’t you check with your local Board of Elections and get a sample ballot. You might be surprised to see there are Congressional races, local county and/or city commission races, U.S. House of Representatives, Judge seats, Sheriff, or even Board of Education. Let’s take the time to focus on the races that really matter. These are folks you might see at your local grocery store, a community event, a local high school football game or even your place of worship. These are individuals who have made a commitment to serve in a public office, and they deserve your respect AND your vote.